Transportation has often been cited as one of the greatest challenges to a 100% wind-water-solar conversion effort. With over 9 million vehicles registered in New York State, much of the control in any conversion effort is in the hands of citizens themselves, and difficult to regulate in our current economic model. In their 2013 report, Mark Z. Jacobson et al outline several claims regarding transportation, and the conversion to sustainable technology. As a starting point for our assessment of these claims, the following table illustrates statistics involving private vehicle registration, public vehicle ownership, and use of sustainable fuel options. In this post, we will be evaluating the following claims made by Mark Jacobson et al. A significant part of establishing a clean-energy economy and industry in New York state is the sufficient replacement of the fossil-fuel vehicle fleet with transportation vehicles powered by clean technologies. Jacobson et al advise adoption of electric, hydrogen, and hybrid vehicles, with an explicit goal of ensuring all new vehicles use these technologies by 2020.While these technologies exist and continue to improve, it is unclear if they meet all the requirements to properly replace the current vehicle fleet, and how soon they will be viable. A vehicle fleet based on sustainable technology will require implementation of new support infrastructure. Such a change will necessarily require a heavy installation cost and rigorous advance planning. Certainly, this infrastructure will mandate the creation of refueling stations throughout the state. According to the US Department of Energy, New York currently has over 400 electric stations, and nearly a thousand charging outlets. While these are commonplace in urban areas such as NYC, Long Island, and Albany, rural areas in upstate New York have sparse coverage and very few charging stations. This infrastructure must expand if the state is to accommodate a high density of vehicle usage. Figure 2: Map of Public Electric Charging Stations in and around New York State. Each triangle represents an electric station in or around New York State. As we can see, electric stations are highly concentrated around urban areas. There is also a significant concern that an expanded vehicle infrastructure, given heavy use, would put incredible strain on New York State’s electrical grid. The grid would need to be both expanded and stabilized to account for heightened and inconsistent vehicle fueling needs, creating a high installation cost. As of right now, it costs an average of around $2,200 dollars to install a one-vehicle electric car charging station on your personal property. Implementing a large-scale facility similar to a gas station could require as high as $100,000 – without regards to staffing, maintenance, and legal costs. (Source) Hydrogen will mandate an even higher transition cost: there are zero public hydrogen stations currently operating in New York State. Facilities are under construction in New York City, but few are planned anywhere else in the state. Notably, hydrogen is a relatively new fuel source, only gaining ground in California. To guarantee its adoption,New York State would have to invest a lot into building fuel stations: These fuelling stations take over 6 months to construct, and cost a staggering $500,000 to 5 million dollars to build. These costs are likely prohibitive, but can be mitigated: a California government program funds up to 70% of the building costs of a new hydrogen station, expediting hydrogen infrastructure’s adoption (Source). The Californian government has similarly promised $50 million to the development of new hydrogen stations in 2015 (Source). Implementing similar incentives in New York State could have similar effects to promote the growth of either hydrogen or electric industries. A large number of electric vehicles are in production, and the trend is positive: more vehicles are being introduced every year, as more manufacturers are adopting electric vehicles as a competitive option. . Examples of purely-electric cars that are currently available are the BMW i3, Chevrolet Spark EV, Fiat 500e, Nissan LEAF, Tesla Model S and more. They range from being economy vehicles, such as the Chevy Volt priced at 35,200, to mid-range, such as the BMW i3 priced at 43,300, to more expensive luxury cars like the Tesla Model X at 80,000. (Source)With increasing competitive adoption, as well as increased variety and support, electric cars should be able to suit the needs of the average automobile user. As hydrogen is less developed as a fuel source, there are far fewer options available. The only current vehicle on the market is the Toyota Mirai, exclusive to Japan and parts of California. (Source) Hyundai has a hydrogen car in production, slated to be on sale in 2016. This vehicle, the Hyundai Tucson,has won awards for its hydrogen-powered engine. (Source) In order to increase the interest in their hydrogen car projects, car manufacturers are offering to provide free fuel, full roadside service, and other benefits. Other car companies, such as Honda and Chevrolet have hydrogen fuel cell prototypes or research in progress, but none are currently available. The major concern with electric battery technology is a low range per charge. Recently, there have been significant improvements, such as the Tesla Model S, which can go up to 265 miles on one charge, and research is constantly pushing the boundaries further. However, these options are uncommon, expensive, and standout: current mass-produced electric vehicles such as the Nissan LEAF and the BMW i3 have lackluster ranges, with a maximum 84 miles on one charge. (Source) Charge time is also not ideal, as it takes around 14 hours for a standard 110 volt charger to fully charge a battery. The 240 volt Tesla Supercharger takes only 20 minutes for a 50% charge, 40 minutes for an 80% charge, and around 3 hours for a full charge, making it a much faster charging experience. (Source) However, this is currently limited to only Tesla vehicles and all other plug-in electric vehicles do not use this technology. With both a limited capacity and a long charge-time, adopting electric batteries as the industry standard would severely limit the private consumer’s ability to drive for long distances.. For hydrogen fuel cells, this is not a problem because the process of refueling a hydrogen vehicle is much like current gasoline vehicles. We find it unlikely that these technologies in their current state would be sufficient replacements for the New York State vehicle fleet. However, research is being done and these technologies are becoming more feasible as a viable industrial standard. In our next post, we will be exploring the potential in current research and assess whether we expect these technologies to meet Jacobson’s claims. Reduced cost / increased economic efficiency. A major challenge facing current technology adoption – and an important metric in Jacobson’s study – is determining the time, cost, and feasibility of transition once technologies become industrially feasible. Barring extreme government measures – for example, criminalizing carbon-emitting vehicles – adoption will be difficult to control, driven by the state of the market and technological feasibility. One study by the National Research Council in 2008 predicted that 2 million hydrogen cars would be on the road by 2023. (Source) Business analysts have predicted that around 10,000 of these will be available in the Northeast within the next 10 years – but this number is spread across several states, and even concentrated would only be a tiny fraction of what is needed to fulfill Jacobson’s plan. Plug-in electric vehicles and hybrids fare only slightly better: In 2014, these vehicles were only 0.71% of the new vehicles sold in the United States, a noticeably small improvement of the 0.62% number posted in 2013. (Source) It would take a tremendous effort to increase that number to 100% by 2020, Jacobson’s target date. A study by the University of California Berkeley estimates that electric cars will comprise 64% of new car sales and 24% of the total car fleet by 2030. (Source) The study takes into consideration many economic and technology impacts, such as environmental concerns, improved infrastructure, future battery improvements, and trade balance benefits. Such a prediction may be far more feasible than Jacobson’s ambitious – although admirable – goals. Notably, however, this prediction does integrate well into Jacobson’s overall target date of 2030 for WWS conversion. Given the current state of electric vehicle technology, it will very likely be technologically possible for electric vehicles to serve as sufficient replacements for current technologies by 2020. It is unlikely however that hydrogen cars will be sufficient replacements in this time, as this technology is far less developed and has not been adopted on any significant scale outside of California. Another area of research is methods of transportation outside of automobiles. There are currently some electric-powered train models in existence, and they are heavily featured in Europe and Japan. Amtrak’s Northeast Corridor, which runs through parts of New York, is electric-powered. (Source) There is an opportunity to transition New York’s rail system to electric in the near future, with more work being done to make them more reliable and cheaper to produce. (Source) There are electric Aeroplanes being researched currently, but most suffer from a number of downsides. As of right now, they have very limited travel distances, are very small and cannot carry more than a few people, and only prototypes exist. (Source) However, in the future they can be expanded to seat more passengers, have solar panels on the exterior to generate power be more sustainable, and have larger batteries to go longer distances. Currently though, electric-powered airplanes are a way off from being a solution, and we do not believe they would be ready for mass adoption by 2020. 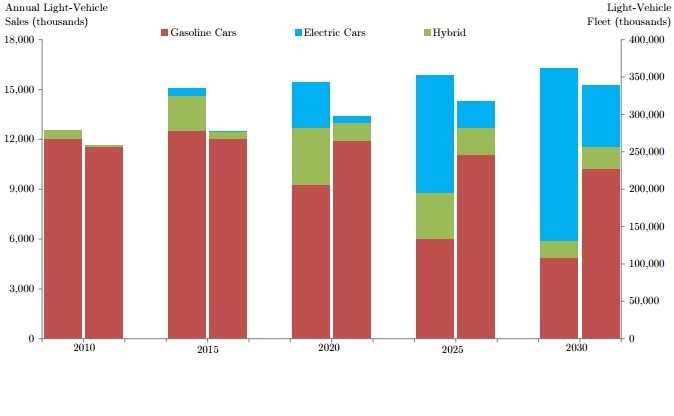 With the overall low amount of support, maintenance, and manufacturing infrastructure, and the strength of competing industries, it is extremely unlikely that all new vehicles sold will be electric, hydrogen, or hybrid by 2020 — barring, of course, extreme governmental measures to regulate industry and prohibit sales of classic, carbon-emitting vehicles. A lot of costly infrastructure progress will have to be made to incentivize people to switch and grow sustainable technologies into the dominant industrial option before such a widespread conversion can take place. The decisions made by New York State in these matters will ultimately determine the feasibility of Jacobson’s goals. As previously discussed, conversion to a 100% WWS powered vehicle fleet within a time period as low as 15 years would be politically infeasible. Widespread conversion of a lesser scale is possible – but faces a barrier in the upfront transitional costs, both on the state and on the transportation industry. Constructing widespread refueling stations, maintenance plants, and industrial facilities will be expensive in any scenario – currently the upfront costs of electric vehicles has made in fact made such an endeavor prohibitively expensive for the industry or even the state. The best hope of mitigating or overcoming these costs would be a system of rebates and tax abatements to lower the initial costs of EVs, coupled with economic penalties to force users of fossil fuel vehicles to bear the social cost of their pollution. Once again, barring any extreme measures taken by the government, any program must seek to reward individuals to make the switch, else it may never take hold in the current economic marketplace. At present there is a $7500 federal tax credit for individuals who purchase electric vehicles – however, fueleconomy.gov lists the average upfront cost difference between electric and gasoline cars as approximately $15,000, exactly twice the current federal incentive. (Source) Therefore, we propose imitating and expanding this program at the state level to eliminate and perhaps outright surpass the difference in upfront costs. Further measures can be taken to reduce incentives for gasoline and fossil fuel vehicles. Assuming that NYS matches the federal credit, replacement of all around 9,200,000 vehicles in New York State would cost a total of approximately $68.9 billion. To drastically reduce the strain associated with conversion and simultaneously make electric vehicles an immediately competitive option, we propose a “sin tax” on gasoline, similar to existing taxes on cigarettes and alcohol. Depending how high the tax is set, fossil fuel vehicles could become prohibitively expensive to purchase, operate, and maintain compared to electric vehicles – automatically incentivizing a public switch to sustainable technology. Such measures are commonly seen in European nations: For example, in Norway, gasoline costs approximately $10.50 per gallon. These measures have met low resistance from the European public and led to a expedited adoption of electric vehicles. A parallel tax in New York could bring in $18.2 billion annually, as the state currently consumes 2.6 billion gallons of gasoline per year. (Source) This could completely cover a program designed to phase in electric vehicles over the five years preceding Jacobson’s goal of a 2020 replacement – but this assumes political feasibility and public buy-in, which may not be present with such a stark increase. A lower tax could more likely incentivize total replacement by 2030. At the moment, Norway has been the most successful country at encouraging EV adoption. Numerous Norwegian policies could be feasibly adopted in New York, including eliminating sales tax on EV purchases, eliminating EV tolls, extending bus lanes and reserved parking spots to EV cars, free ferry transport, and free charging at municipal stations. These “comfort incentives” have counterbalanced consumer concerns like range anxiety by providing perks that wouldn’t be available in a fossil fuel vehicle. Should they prove an economic strain to the state, these programs could eventually be alleviated once conversion has become more widespread – However they should be maintained for as long as possible to guarantee a higher conversion rate. Crucial to this conversion effort are programs that enable individuals with poor liquidity to purchase EVs. A fantastic possible option for this comes from a similar program for PV installations known as PACE (Property Assessed Clean Energy). PACE allows businesses and individuals to take a loan through local government to purchase solar panels if they can prove that their project will be cashflow positive after the installation is built. This allows groups and individuals who would normally not be able to afford a loan to gain the capital they need without affecting their personal credit. This not only mitigates liquidity concerns; it avoids opportunity costs associated with taking large loans, and assists consumers in paying off the initial cost of the vehicle. The greatest barrier to conversion however remains timescale: Even if EVs are preferable to fossil fuel vehicles for future purchase, the problem remains that most people are not planning to purchase a new car within the next few years, and that many of those who do will prefer to buy used vehicles. At the moment, the electric used car market is very small, and there are many concerns about the longevity of older batteries, which often need replacement around the 8 year mark, and can cost around $10,000 or more, making a used EV a risky investment. For many consumers, then, used electric vehicles are not a competitive option. A feasible alternative may be to initiate a larger rebate for new EVs, to make them competitive in the current marketplace. As we have previously discussed, due to the extent of individual control over transportation industries, a 100% conversion is unlikely to happen for decades to come given any incentives barring an outright ban for carbon emitting vehicles. However, the combination of these programs should ease the transition and begin a more rapid conversion to sustainable options. Given the political and economic climate of New York, it is far more likely that a conversion to electric vehicles by 2030 or later may prove most viable. With a total vehicle fleet of over 9 million in New York State, conversion costs are staggering (Source). While measures can be taken to alleviate transitional concerns, these steps come at a great cost to political capital, personal livelihood, and potentially the state’s industry and economy. Key to this conversion effort is expediting the overall legal and economic process while minimizing conversion costs. Jacobson claims that such a transition can be expedited by streamlining and expanding public transportation. Doing so will mitigate the state’s overall carbon footprint while simultaneously reducing the need for private vehicles. Much of the state’s public transit capacity exists in the metropolitan area. Assessing Jacobson’s claim requires analysis of the industrial, economic, and political constraints surrounding the expansion of New York City’s public transit systems, as well as other opportunities for public transit that may exist statewide. This prolific and comprehensive system has reaped enormous environmental benefits: the MTA’s transit load emits around 2 million metric tons of pollutants annually, while avoiding emission of around 17 million (Source). Further expansion of this network will be necessary as the city grows; as the MTA grows in effectiveness, it will continue to reduce the need for private transit and offset environmental degradation, while bolstering the local economy through new jobs and infrastructure development. However, the MTA is already meeting economic barriers due to its bold expansion efforts. According to State Comptroller Thomas DiNapoli, the MTA is facing a deficit of over $12 billion due to current expansion efforts – indicating that its budgetary strain may be outpacing the density of its ridership (Source). With the MTA facing severe economic strain, expediting the growth of public transit within the city may be unfeasible barring federal aid or an increase in state funding. Focusing on New York City only grasps one piece of the problem: almost ⅔ of state citizens live outside of the New York City area – and with transit use already six times the next city’s, the need for improvement is not as drastic (Source). Complimenting this, upstate New York possesses approximately 7,400,000 of the state’s total 9,200,000 vehicles (Figure 1). Upstate public transit is troubling in both organization and magnitude. Among rural communities, where private vehicles are more commonplace and more readily flexible, long-term travelers are the most feasible demographic for public transit. In that regard, continued expansion of Amtrak systems and local bus networks present the best opportunities to expand public transit. The Capital District Transit Authority, servicing Albany, Rensselaer, Saratoga, and Schenectady County, has made strides moving public transit forward, according to their most recent annual report (Source). in 2013-2014 the CDTA provided transportation for approximately 16.5 million people, up 14% from three years ago. This number is high for a program that covers an area with a population of 769,000, funded by an operating budget of only $76.1 million (less than a tenth of the MTA’s budget). CDTA operates 306 vehicles – largely busses – and has been moving towards a sustainable fleet, as 50 of its vehicles now run on hybrid electric power (Source). Expansion of this program (or of other upstate programs as modeled by the CDTA) is low-difficulty: it primarily requires the purchase of new, efficient vehicles, and the hiring of new employees. It seems possible to grow public transit programs for the foreseeable future – CDTA experienced a 14% growth across the past three years(Source). Yet an analysis of participation rates and traffic through the two programs highlights that there is still a disparity in participation rates: It will be difficult to drastically increase the ridership of these rural networks, especially if we are to bring participation up to urban standards. Figure 6 compares basic statistics on the CDTA, and the metropolitan area’s MTA. As the programs exist at a severely different scale, comparisons will focus on proportional inefficiency. A simple cost / rider comparison reveals similar value between the two – The MTA averages out at .198 riders per dollar, while CDTA actually averages .22 riders per dollar. However, the higher employee base and upkeep cost for various MTA facilities – in addition to a broader hourly schedule and the sheer task of maintaining facilities such as subway stations – explain this budget discrepancy. An analysis of traffic numbers produces a more telling result: The MTA has approximately 40,000 riders per employee, while CDTA has around 26,000. This speaks to the greater density of traffic through the MTA bus and subway programs, and is revealing of the disparity in use between transit systems in urban and rural areas. Both rural and urban programs seem to be expanding despite their financial barriers – and these programs seem to present clear environmental benefits. Jacobson’s claim that public transit’s expansion can reduce the transportation footprint is not only valid – it is already occurring. What remains to be seen is how quickly and effectively that expansion can occur: with the MTA in debt, expansion in the city seems to have stalled. Furthermore, as long as there is a participation gap between urban and rural areas, there will remain a challenge of diminishing returns for any program in upstate New York. In addition to a focus on public transportation, a greater emphasis on telecommuting could reduce the need to commute entirely. Investigation into the practice of telecommuting has demonstrated several legal obstacles and cultural barriers to its adoption. However, growing public familiarity with telecommuting has lead to increased acceptance of the practice, so we believe telecommuting is a feasible option for most non-service workers with immediately tangible benefits. Further adoption of telecommuting practices would inherently lower the transportation needs of the workforce. Telecommuting can generally be defined as the practice of working from outside of the office (Source). However, there is continued uncertainty about when a worker can be considered a telecommuter (Source). The simplest definition includes flextime: work hours that can either be used at home or from the office. Many employees have a small number of weekly or monthly flex hours. Under this definition, one in every five adults worldwide would be considered a telecommuter (Source). Following these terms, it is estimated that a simple increase among current telecommuters – to 40% of national telecommuters working from home half their days – could reduce oil consumption by 280 million barrels per year. This change would reduce greenhouse gasses by 9 million cars per year, and saving $650 million nationally (Source). A more specific definition of the telecommuter will be used here: Telecommuters are full-time employees that choose to work either at home or remotely for at least half of their working hours (Source). This definition paints a more accurate picture – Following this standard, the vast majority of US workers do not telecommute on a regular basis. Perhaps most significantly, a 2009 paper by Wendell Cox in the Information Technology Innovation Foundation suggested that a 14% increase in telecommuting may eliminate as many as 136 billion miles of vehicle travel and 55 million metric tons of CO2 emissions by 2020 (Source). Cox further highlights several economic and individual benefits that support telecommuting as a beneficial practice for workers and employers alike. The strongest and most visible barriers to widespread adoption and implementation of telecommuting are economic or legal in nature. Five states – including New York – tax telecommuters for income earned through in-state companies. Should a resident of another state choose to telecommute to New York, New York State will tax their income – in certain cases, this can result in a higher total tax liability for telecommuters (Source, Source). While this rule only covers cases with an out-of-state telecommuter, and is waived in the instance of mandatory telecommuting imposed by employers, it still presents a major deterrent to telecommuting. Eliminating this law is essential to restoring New York State telecommuting as a viable industrial option. While effective at increasing individual productivity, telecommuting has been known to reduce employees’ opportunities for promotion and advancement due to reduced connection between employees and their managers. Similarly, remote communication has been known to cause frustration and a breakdown in team cohesion (Source). Lack of motivation and a broken expectancy connection between effort and reward were major factors in Yahoo CEO Marissa Mayer’s decision to ban telecommuting in 2013 (Source). If telecommuting becomes more widespread, companies will have to take careful measures phasing it into greater use. There are also key legal challenges in adoption of telecommuting. Compliance with wage/hour laws and safety regulations such as the Occupational Safety and Health Act (OSHA) is difficult to track and maintain. Risk management and compensation are in a grey area as regulations normally covering compensation for workplace injury now extend to workers’ own homes (Source). There are concerns that accessibility requirements may also force companies to pay for renovations to the homes of their disabled workers, in the event that those workers decide to telecommute. OSHA regulations in these areas (of privacy and access to workers’ homes) are effective but need further development – privacy violations may still occur in edge cases where the company claims workplace health concerns or liability. If telecommuting is to expand, these cases need to be clarified (Source). Another likely barrier to telecommuting, however, is a cultural and individual one: Telecommuting often leads to a longer workweek as the home becomes the workstation (Source). Many telecommuters experience a significant sense of isolation. 62% of telecommuters feel that they are not a part of workplace social circles, or that they experience regular feelings of loneliness (Source). Should telecommuting become commonplace, there could be ramifications on our greater societal morale, productivity, and sense of community. On an individual level, scheduling habits such as exercise and in-person meetings with coworkers during off hours can help keep anyone involved in the social scene and avoid a self-imposed schedule overload. Employers may take steps to ensure that telecommuters are included in all meetings and social gatherings. However, any cultural or behavioral shift is hard to guarantee on the long-term: there is little that can be done to ensure the individual self-regulation necessary to mitigate these issues. By the New York Times and the Journal of Accountancy, telecommuting in New York State is up almost 80% from 2005, and the practice seems to be on the rise (Source). The benefits of telecommuting are also very well documented, providing great incentive for adoption. Individually, a Stanford University experiment has shown that, provided an adequate standard of home living, telecommuting can reduce quit rates by 50% due to its greater sense of work-life balance. This has also been shown to increase productivity by almost 13% (Source). Rapid growth, expected to result in a 16% reduction of work-related travel and associated greenhouse gas emissions. Over 80% of urban growth since 2000 has emerged in areas with high rates of telecommuting. A 3.2 million net migration to metropolitan areas with high rates of telecommuting. 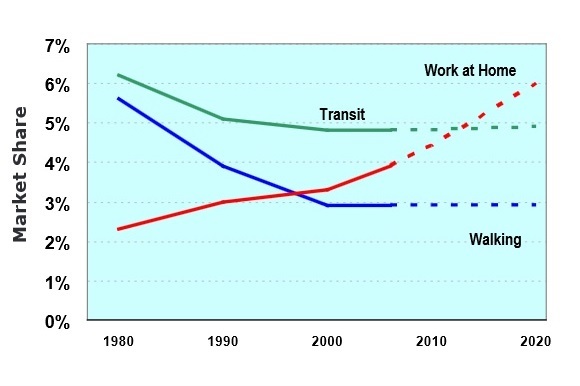 Current trends projecting telecommuting to exceed carpooling by 2030. Rise in telecommuting as a mainstream business strategy. Improved economic productivity by virtue of reduced travel time. It would thus appear that telecommuting is headed in the right direction to become more widespread, despite present barriers. Significant economic, legal, and cultural obstacles exist that may limit the growth of telecommuting, but the practice is undoubtedly becoming a feasible model, as Jacobson suggests. Even a moderate adoption rate will create significant environmental gains while simultaneously reducing the overall costs for a vehicle fleet conversion. 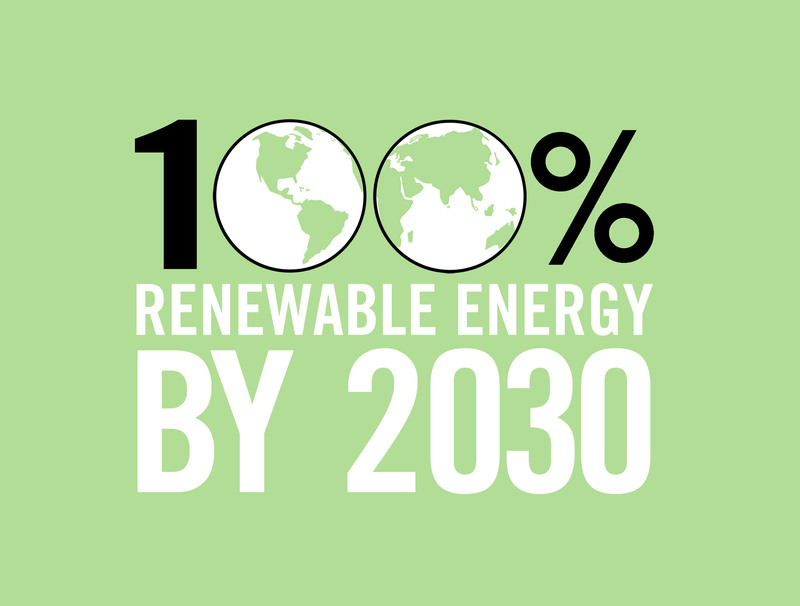 Transportation is usually cited as the biggest obstacle to getting to 100% clean energy by 2030. Jacobson provides some responses to criticisms of his report, including the use of hydrogen. point 6. A friend of ours just bought a Nissan Leaf for a much lower price than cited in the article. This may be because of the various federal tax credits but that should be more clearly stated. They say the base price is $22k with the federal tax savings. A big problem is that once people buy a vehicle, they want to use it til it falls apart, so that makes them getting off the road by 2030 more a challenge. The other big challenge is airplanes. Article yesterday about electric planes. NASA is building a ten engine electric plane, An electric plane factory is starting in France. Also articles re biodiesel. Probably need more discussion re changing transportation patterns away from individual cars and trucks (mass transit, high speed rail, anti-sprawl measures). NYC is having a major debate over congestion pricing to change transit patterns.